 Chicken with kale and olives, recipe below, made with  chicken thighs,  Tuscan kale and  castelvetrano olives (photos 1-3 courtesy Good Eggs, photo 4 courtesy Maiden Lane Restaurant | NYC). 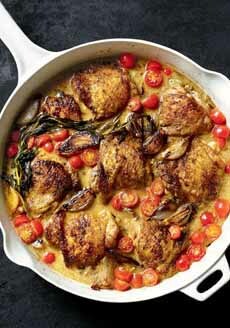 Every time we see chicken thighs on sale, we load up and make recipes like these, plus a big vat of chicken soup (Jewish-style and Mexican-style chicken soup recipes). Chicken thighs are economical, versatile and more flavorful than white meat (frankly, we can’t understand the premium placed on white meat chicken and turkey). We also love the ease of one-pan cooking in the recipes that follow. You can bring the entire pan to the table and serve from there (be sure to lay down a trivet ahead of time). These two recipes are from Good Eggs—a terrific purveyor of groceries in the San Francisco area. Serve them with a green salad and some crusty bread to sop up the pan sauce. Sweet from the tomatoes and salty from the olives, this recipe features the it green of the moment, kale. If you don’t like kale, substitute beet greens, broccoli rabe, chard, collards, spinach or other greens (we used mustard greens). Cook time is 35 minutes. 1. WARM a 9-inch cast iron pan inside an oven preheated to 425°F. Salt and pepper the chicken thighs on both sides. When the oven is hot, carefully (carefully!) remove the pan from the oven and add the thighs, skin side down. Place the pan back in the oven and cook the chicken until browned and the internal temperature reaches 165°F, about 30 minutes. 3. ADD the tomatoes, thyme and olives and turn the heat down to medium-low. Cook until the tomatoes have released their juices and the sauce has a nice consistency, about 15 minutes. 4. ADD the kale to the tomatoes and combine with a pair of tongs. Cover the pan for a few minutes to let the greens wilt, then uncover and stir again with the tongs. 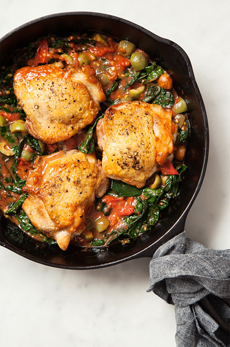 Cook the kale and tomatoes together over low heat until the chicken is ready. 5. PLACE the cooked chicken on top of the greens and serve in the skillet. *We use canned San Marzano tomatoes when fresh tomatoes are out of season. 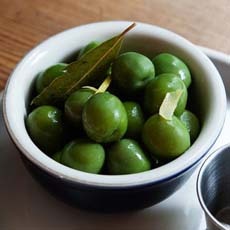 †Castelvetrano olives from Sicily are the “greenest” green olives. Not only does the color look great, but these meaty olives have a unique flavor that makes them our favorite. Here’s more about Castelvetrano olives. 1. PREHEAT the oven to 475°F. Season the chicken with salt and pepper; let it rest until it reaches room temperature. Here’s the recipe from the New York Times, which adds shallots and Dijon mustard to the recipe. 4. USE a spoon to roll the tomatoes around in the chicken drippings, flip the thighs skin side up and transfer the skillet to the oven. Cook for another 13 minutes. 5. REMOVE from the oven and check the chicken for doneness by making sure internal temperature is 165°F (or the juices run clear). Remove from the heat and let the chicken rest for a few minutes for the juices to settle. Bet you can’t name them all! Check out our Chicken Glossary.